September 9, 2016 / Amanda / Comments Off on Sixteen-year-old learner explains why active citizenship rocks! 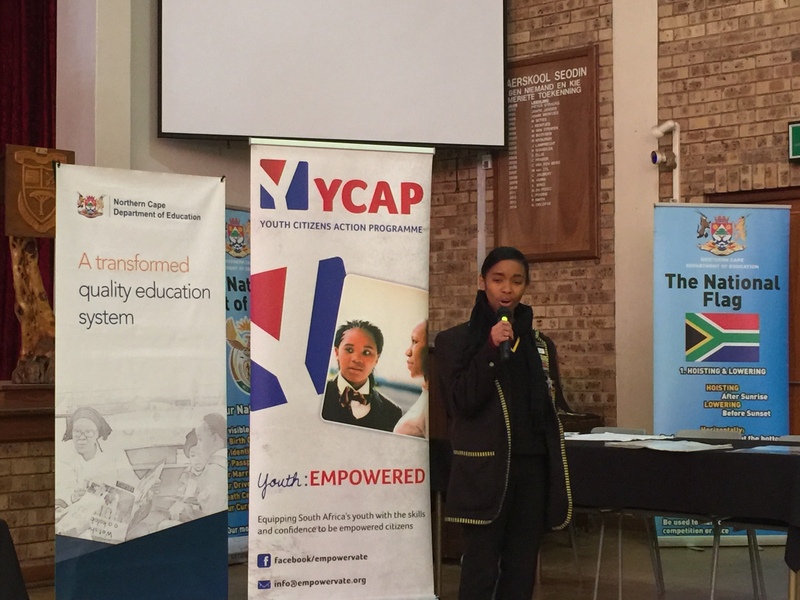 We decided to publish a copy of the speech made by 16-year-old Maxcean Danster from Kalahari High School that she made on the day of the Youth Citizens Action Programme’s Northern Cape Provincial Showcase event on Youth Day, 16 June 2016. It is an honour for me to have the opportunity to speak to people who absolutely inspire me. You know I came across YCAP not too long ago. Yes I was fortunate enough to be invited to a presentation. There I met Mr. Tsepho and Mam Elize. Two to people dedicated to this project right off of that meeting we jumped into this project we follow all the steps inside the booklet provided and formed a group of warriors the stand together against bullying, #TeamT.A.B. What I loved most about the process was that we had to go through is the fact that I have seen people grow. There is nothing more beautiful than people believing in their dream, in their vision and in their goals. I do not think we realise just how vulnerable we are. As leaders we put ourselves out there. We are open to critic, to mockery and humiliation. However, being a leader means that you have looked past every single negative to make every situation positive! Speaking of what we can do for our country. Lets reminisce on a remarkable moment that we celebrate on the 16th of June – Youth Day. Now, you have probably heard the story a thousand times, yet I will tell you about it again because I am that cute. 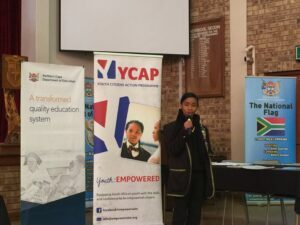 A group of learners in Soweto decided that enough was enough. They demanded better education; they declared that they would not be taught in a language that was that of the oppressing government. They said, No! No! No! They are not going to be taught to become maids, servants or farm workers. They had rights. They had dreams and they were willing to die for it. As we know many lives were lost that day. May those souls rest in peacefully as today; we are living their dream. We have the right to education, proper education and it is our responsibility to become doctors, engineers, lecturers and accountants. In conclusion, I want to remind you of the power we possess. It takes one person to impact an entire community, an entire nation, and the entire world. Why am I so certain about this? People like Nelson Mandela, Mahutma Gandi, Walter Sisulo and Martin Luther King II have shown us time and time again. We can look to our own CEO, Ma’am Amanda, for such inspiration. So why can we not do it too? Let’s take interest in different cultures and language so that we can understand each other. As I stand here I can say with great pride that I can speak 4 languages – English, Afrikaans, Sestwana and IsiZulu. To everybody participating today. You guys rock! Your efforts and good deeds have paid off. Julle is ysters! Good luck to all of you. Break a leg. Let the show begin. God bless Africa! Guide the leaders, save our children and give us peace.